We are sorry to have to cancel the free genealogy meeting set for this Monday evening, 2/11/19, due to the continued snowy and icy conditions and the likely chance of more snow tomorrow and Saturday. We have rescheduled Mary Kathryn Kozy’s talk to Monday, April 8, 2019, and invite you to join us then. Attached is the updated flyer for her talk. 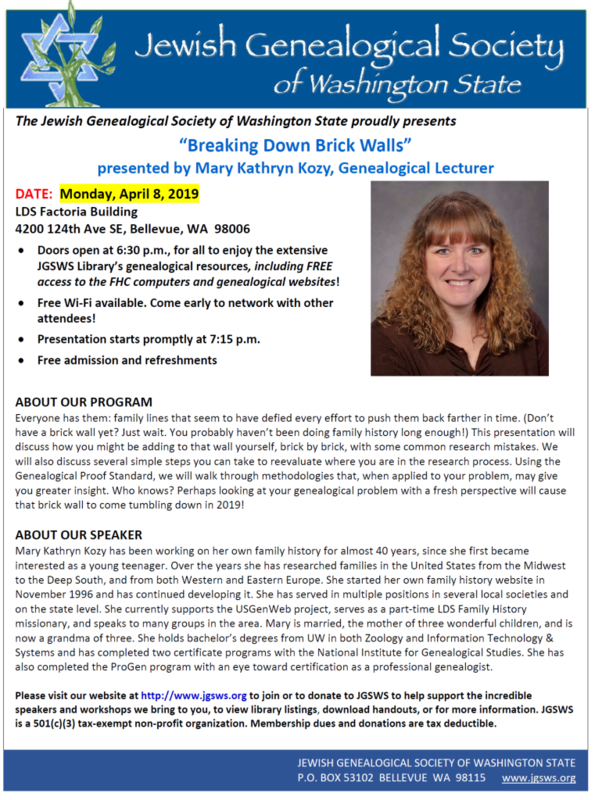 Also attached is the flyer for our Monday evening, March 4, 2019 free genealogy meeting. We are hosting Mark Olsen, of Family Tree Maker. Please note that his talk is on the first Monday of March and the location for this one meeting has changed to the Downtown Bellevue Public Library. Would it be possible for you to post the attached flyers on your bulletin board, calendar and/or website for upcoming events? Our upcoming events, on 3/419 and 4/8/19, are free to the public. If it would help for me to mail you color paper copies of the flyers, I’d be happy to – just let me know! 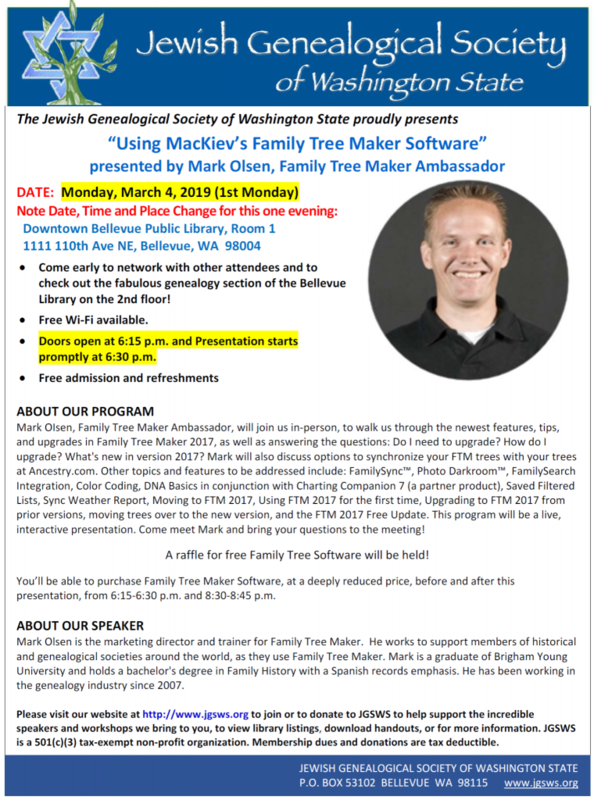 Mark OIsen, Family Tree Maker Ambassador, will join us in-person, to walk us through the newest features, tips, and upgrades in Family Tree Maker 2017, as well as answering the questions: Do I need to upgrade? How do I upgrade? What’s new in version 2017? Mark will also discuss options to synchronize your FTM trees with your trees at Ancestry.com. Other topics and features to be addressed include: FamilySync™, Photo Darkroom™, FamilySearch Integration, Color Coding, DNA Basics in conjunction with Charting Companion 7 (a partner product), Saved Filtered Lists, Sync Weather Report, Moving to FTM 2017, Using FTM 2017 for the first time, Upgrading to FTM 2017 from prior versions, moving trees over to the new version, and the FTM 2017 Free Update. This program will be a live, interactive presentation. Come meet Mark and bring your questions to the meeting! A raffle for free Family Tree Software will be held! You’ll be able to purchase Family Tree Maker Software, at a deeply reduced price, before and after this presentation, from 6:15-6:30 p.m. and 8:30-8:45 p.m.
Everyone has them: family lines that seem to have defied every effort to push them back farther in time. (Don’t have a brick wall yet? Just wait. You probably haven’t been doing family history long enough!) This presentation will discuss how you might be adding to that wall yourself, brick by brick, with some common research mistakes. We will also discuss several simple steps you can take to reevaluate where you are in the research process. Using the Genealogical Proof Standard, we will walk through methodologies that, when applied to your problem, may give you greater insight. Who knows? Perhaps looking at your genealogical problem with a fresh perspective will cause that brick wall to come tumbling down in 2019! This entry was posted in Society News and tagged Jewish Genealogical Society.